I’ve not posted much this summer. I’ve actually been very active in Dutch ovening. I’ve cooked quite a bit, and I’ve judged a few cookoffs. But I haven’t been writing much. There are a lot of reasons for that, including overall stress and working on another book, but the big reason is that I’ve been working on a big Dutch oven project in the back yard. Last week, it was unveiled. I’ve been building an outdoor kitchen! As many of you who read my blog know, I like to cook all winter long. I also like to cook when it’s raining or any other kind of inclement weather. Basically, I like to cook, and I don’t like it when the weather gets in the way. 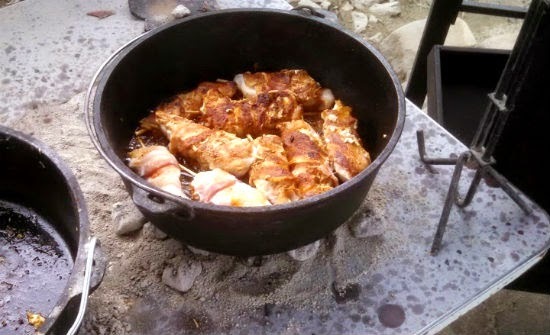 Now, at times, I’ve used umbrellas, tarps, or caps, or even moved my cooking onto a covered porch or into my garage. But those really aren’t solutions to the problem. 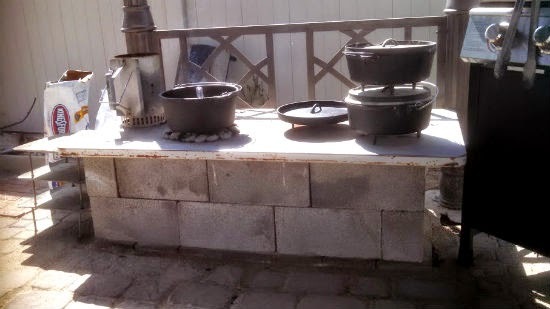 So, this spring, my sweet wife and I talked about options for making a good Dutch oven space in a corner of the yard. It started out simply enough. I had a mental vision of a sort of wood shelter overhead with a shallow deck underneath. Jodi, on the other hand is a master at finding things cheap, and secondhand. 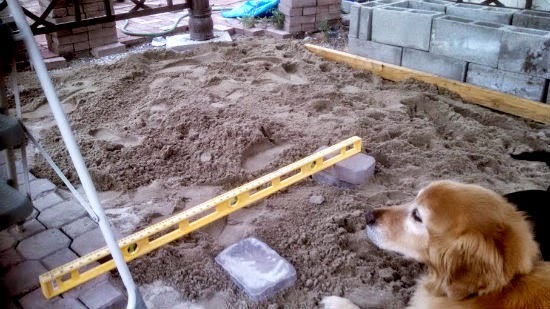 She used a local classified ad website to find cheap paver and patio bricks, similar to the ones that were already in place in other parts of the yard. 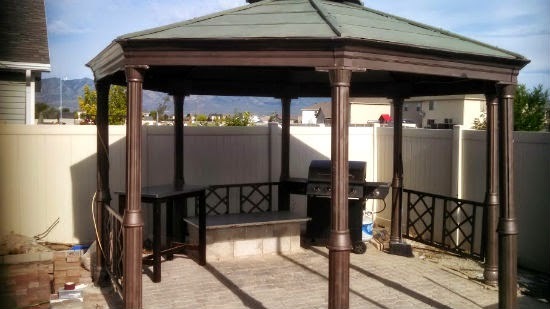 She found a 13 x 13 metal gazebo that someone who was moving wanted to sell for next to nothing (I spent two weeks disassembling it, then bringing it home, and digging and pouring footings for it before reassembling it in all its glory). Laying the brick was a real challenge for someone of my weight and age. It really killed my knees. I used cinderblock and a steel table for the cooking space, and I brought out a tall bar table to use for food prep. The grill fit in nicely, and my father-in-law built a rolling serving table. But finally, it was all done. Last Sunday, we had visitors over, friends from Jodi’s work. 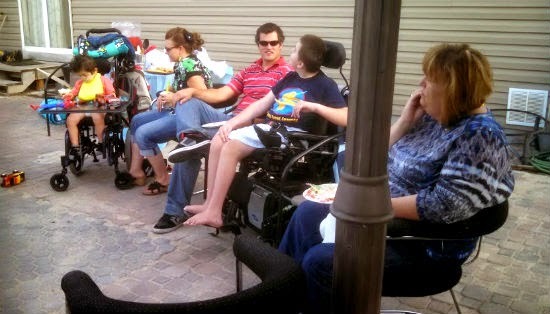 Other families with kids with special health care needs. We all sat around and ate well while visiting and playing guitars! I cooked bacon-wrapped chicken, au gratin potatoes, and brownies. I also made a couple of loaves of sourdough bread that were amazing. Two of the best I’ve ever made, I think. I’m very excited to use it over the years to come!